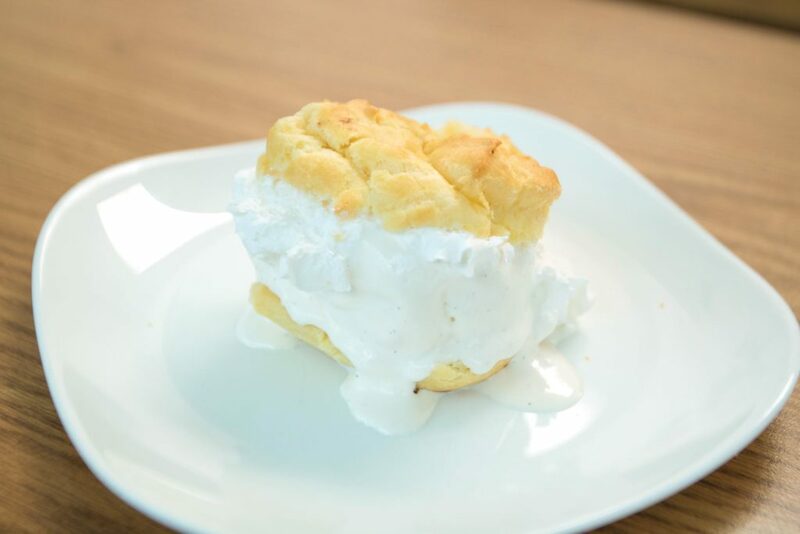 Ice cream cream puffs are one of my favorite treats on a hot day, but I find that buying the tiny frozen puffs in stores are really not worth the price. The outside crust is not as crisp as a cream puff’s exterior should be, and there is not a large variety in flavor. These cream puffs are quite simple to make; with just four ingredients, it is not much of a hassle. Also, you can choose your favorite flavor of ice cream instead of just sticking with vanilla. I like to add a teaspoon of fresh coffee grounds into the batter to give the cream puffs a little more depth in flavor, which goes very well with vanilla or chocolate ice cream. If you have cocoa powder on hand, you can add a tablespoon of that into the batter as well. One important note for cream puffs: Do not open the oven door while the puffs are baking or you will have deflated lumps instead. The sudden flow of cold air will make the puffs flatten instantly, so let the puffs cool in the oven for about 10 minutes or so before removing them. A sweet frozen treat — perfect for a hot summer day. These cream puffs are quite simple to make; with just four ingredients, it is not much of a hassle. Heat water and butter in the saucepan on medium heat until butter is melted. Remove from heat and mix in flour and salt while butter mixture is still hot. If you’re using cocoa powder or ground coffee beans, you can add them in with the flour. Mix until the dough forms into a ball and no longer sticks to the sides. This mixture should be the consistency of playdough. Let dough cool until warm to the touch. Pipe 2-inch circles onto a parchment lined baking tray. If you don’t have a piping bag, a Ziploc bag will do. Just fill the Ziploc bag and snip off one of the edges. You can also just plop spoonfuls of batter on the tray. Let cool in oven for 10-15 minutes. Remove from oven and cool on the tray. Slice puffs in half and fill with a scoop of your favorite ice cream. Optional: Top with chocolate sauce, whipped cream, Oreos, candy or nuts.